The Mad God's Amulet is the second in Michael Moorcock's four-part series "The History of the Runestaff", featuring Dorian Hawkmoon. With the power of the Black Jewel permanently blocked by the mystic Malagigi, Hawkmoon and loyal companion Oladahn set out on the long to home to Castle Brass. Throughout the continent, however, they are sought by agents of the Dark Empire. Before long, Oladahn is captured in the ruins of the city of Soryandum by Hulliam D'Averc, one of the most memorable characters in the series. D'Averc is a brilliant painter, architect, tactician, commander and swordsman, as well as a hypochondriac and a Don Juan. With the aid of the wraith-folk of Soryandum, Hawkmoon and Oladahn make a dramatic escape. Determined to avoid further meetings with the armies of the Dark Empire, they board a ship. Floating on a raft is none other than D'Averc. Explaining that he has no desire to be punished for his failure to bring Hawkmoon back to face Meliadus and King Huon, D'Averc throws in his lot with Hawkmoon. When the ship is set upon by pirates not once but twice, D'Averc's swordsmanship and cleverness prove useful. Shockingly, they learn that Yisselda has been captured by the same band of pirates, those ruled by the Mad God. In an attempt to rescue her, the trio track down the pirates lair. They follow the lead of the Warrior in Jet and Gold, who has appeared because it suits the Runestaff's purposes that Hawkmoon destroy the Mad God and who assured Hawkmoon that he will be unable to rescue Yisselda until the Mad God is destroyed. The Mad God, it seems, has taken the Red Amulet, which the Runestaff has decided rightfully belongs to Hawkmoon. Can Hawkmoon defeat the Mad God and return to save Castle Brass from the Granbretanian's siege? 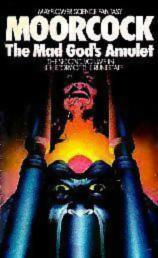 The Mad God's Amulet follows well in the pulp novella spirit of "The Jewel in the Skull". Daring adventures and adventurers, clever escapes, insurmountable odds, crazed pirates, and the convenient arrivals of allies creates a whirlwind of good fun. Hawkmoon himself, however, is not one of Moorcock's strongest characters. He is frequently up-staged by more likeable, witty, and clever companions. 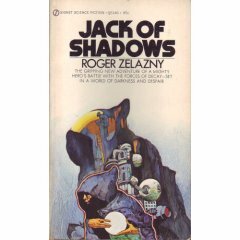 For fans of adventure fiction, sword and sorcery, and pulp, this rates a 7 out 10. For other readers, don't bother.